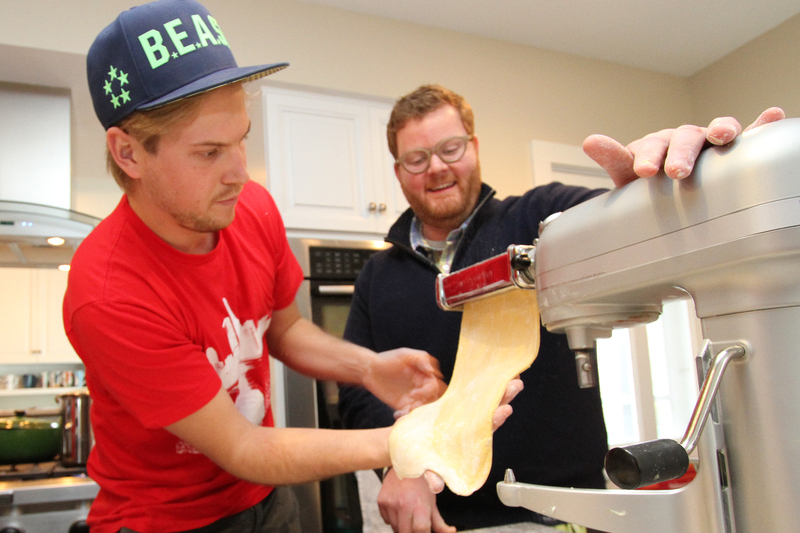 Fresh off preparing a meal for Wabash trustees, Cuoco Pasta Founder Mark Shreve ’04 taught students how to make pasta during an impromptu session in Professor Rick Warner’s kitchen last week. Steve Charles—The connections between alumni and students set Wabash apart from most colleges, and grads enrich learning here in many ways. Often that learning takes place during an internship at an alum’s workplace. But when alumni return to campus, we get a close-up look at the real-world perspective they offer students, not to mention the variety and liveliness of those interactions. Last week I photographed the visits of two of those alumni: Mark Shreve ’04 and Frank Buerger ’73. Take a look at “Never a Job” and “Learning Happens Everywhere Here” at Wabash Magazine Online. NEW ORLEANS, La. 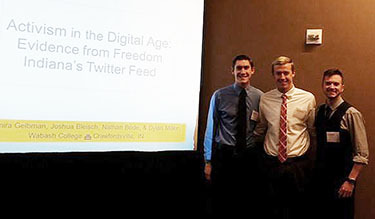 – This past weekend we (Joshua Bleisch ’16, Nathan Bode ’16, and Dylan Miller ’16) traveled to New Orleans, Louisiana for the annual meeting of the Southern Political Science Association (SPSA) to present the results of an independent research project we have been working on with Dr. Shamira Gelbman for the past year. The project, entitled “Activism in the Digital Age: Evidence from Freedom Indiana’s Twitter Feed,” looks at the way the coalition group Freedom Indiana used Twitter to mobilize its followers to take political action. While at the conference, we attended a handful of panel discussions on a variety of topics, ranging from judicial politics to the implications of the Affordable Care Act on reproductive rights. We also met other political scientists who research the use of Twitter by political organizations and politicians. We presented our research as part of a panel regarding the development of interest group networks. Our presentation went well and garnered great questions and discussion among the audience and panel members. From the discussion, we were able to identify potential areas for development and improvement in our research. If the opportunity presents itself, we now have a good grasp of where we would like to take this research in the future. This independent study has allowed us to develop stronger research skills as well as an interesting insight into the life of academia, especially political science. We would like to thank Dr. Gelbman for her mentorship and allowing us to be co-authors on this project. We would also like to thank the Hadley Fund, Division III, the Political Science Department, and the Undergraduate Research Committee of Wabash College for providing the financial support that enabled us to present our research at this conference. 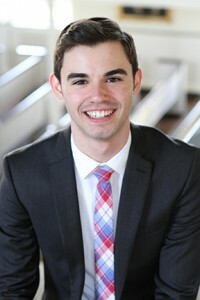 Richard Paige – We talk often of connections at Wabash, and I’m still caught off guard at times at how the shared experience of being a Wabash man makes for seemingly instant friendships. I had lunch with Larry Haugh ’66 and Jeff Callane ‘94 while spending New Year’s in Burlington, Vt., and enjoyed an easygoing conversation that lasted more than 90 minutes over pizza not too far from the shores of Lake Champlain. Math majors each and Indiana natives, Haugh and Callane took slightly different routes to Burlington. 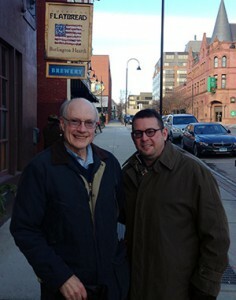 Larry Haugh (left) and Jeff Callane on St. Paul Street in Burlington, VT.
Callane, a Sigma Chi, followed his other brother, James ’92, to Crawfordsville to play tennis for George Davis (“Holy cow, there is a Callane who can volley,” is what Davis is reported to have said upon seeing the younger Callane play for the first time). He’s now an account executive for Aon, the global insurance and risk management provider. Separated by 28 years at Wabash, these two had never met, but you wouldn’t know it by the warmth of the conversation. They talked over the top of each other, finished thoughts, cajoled, and laughed…all the things that friends do when talking. Having two guys at the table gave me the opportunity to present the Wabash Q&A to multiple people for the first time. Their conversation is below. I hope their conversation reads as engagingly as it came off in real time. Me: What’s your favorite Wabash tradition? LH: Definitely not the singing. JC: You mean Chapel Sing? It is the most ingrained. LH: That’s emphasized at Big Bash. Do you ever go back? They recreate the Chapel Sing, so that’s funny. Did they have the greased pole climb when you where there? Some of the traditions die out. Pan-Hel was a big tradition and party, so I assume that’s still going strong. Fraternities and living units used to put a lot of work into that with decorations and inviting your dates to campus. It was a big weekend. Otherwise, it’s just going back to the fraternity where I lived and seeing how that’s changed. JC: Homecoming was always interesting, too. Me: Life is full of successes and failures. To this point, what is your favorite mistake? LH: I hate these kinds of questions. I’m a math major. JC: (laughs) Maybe I should have gone to class a bit more often. Me: If you could cook one meal, what would it be? LH: Any breakfast for me. JC: Hands down, it has to be Elsie Burgers. Elsie was our cook at the Sig house. Oh, the Elsie Burgers. Me: If you could give your 10-year-old self a piece of advice, what would it be? LH: I do have an almost 10-year-old grandson and I would tell him to try a lot of different things and enjoy the trying of them. He’s doing that pretty well now. JC: I would have to say, in the entire life sense, to be polite. Say “please and thank you”. “Please” and “thank you” go a long way. Do your best. LH: That’s something we’ve worked on quite a bit with our grandson. Me: Do either of you have a personal credo, and if so, what is it? LH: Closest to that would be a saying that’s been passed down in my family, “Be yourself.” It was on a big log that used to hang in my grandfather’s cabin. JC: I remember one thing – this isn’t mine – my first boss always said, “Hurry up and get it done, but take your time and do it right.” The M.O. that I’ve tried to live by my entire life works out like this: If you come in early, you’re going to stay late. If you come in late, you are going to leave early. Me: If in your dreams you could have created one great piece of art, what would it be? JC: Having the opportunity to study in Salzburg my junior year and getting a chance to go through museums in Germany, Paris, and Amsterdam, I can’t say there is any one that stuck with me. You know, Bob Ross, the old landscape painter – a little tree likes to live here – I’ve kind of tried a little oil on canvas. I’m not very good. It would be a personal landscape. Me: If a picture is worth a thousand words, what are you doing in that picture? JC: Oh man, I’ve got a huge grin, standing at the top of one of these mountains getting ready to ski down with my kids. LH: That’s appropriate for me, too. I just love doing things with the family. Anything with the family is enjoyable. JC: A big smile. When you see a smile like that, it’s infectious. Me: If you could wish for one thing in your future, what would it be? LH: I’ve been lucky to be healthy for this long, so I’d like to see that continue…to be able to actively travel. JC: With an almost 13-year-old and a 10-year-old, I really just want to see them happy and successful with whatever they choose to do. Maybe there is a Wabash future for my son, Jack. Speaking of connections, here is one more. Callane and his family first moved to Burlington about three years ago. He was wearing a Wabash sweatshirt to one of his son’s tee-ball games when the coach approached him and asked about the sweatshirt. Callane wondered how the coach knew of Wabash. “I work with a Wabash grad,” was the reply. Sometime later, Callane was with his daughter, Neeve, at her sixth-grade open house at Colchester Middle School when someone shouted, “Hey, Wabash,” as he passed by. That’s when he met John Upchurch ’97, a teacher at the school. Callane and Upchurch since have gotten together frequently for Monon Bell viewings and such. “Had I not been wearing that sweatshirt, it might have taken a lot longer to make the connection,” said Callane. To bring this connection full circle, Neeve is now a student in Upchurch’s class. Steve Charles—As the editor of a quarterly journal, I tend to view the year’s significant events as being connected to larger trends and to the history of the College. A Rhodes and Three Fulbrights—Jacob Burnett ’15 being selected our first Rhodes scholar since Jeremy Robinson ’04 coincided with Susan Albrecht’s first year in the newly created post of graduate fellowship advisor. Correlation does not prove causation, but for the past several years faculty and staff—from Professor Eric Olofson and his Graduate Fellowships Committee to Albrecht’s work this year—have become more intentional and focused on helping students obtain graduate fellowships. A Rhodes scholar and a record three Fulbrights—Adam Barnes ’14, Patrick Stroud ’14, and Sebastian Garren ’14—all in one year. That’s a promising trend. 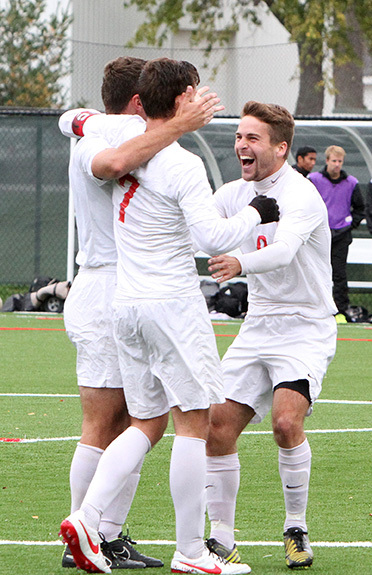 Golden Age of Wabash Sports—I had the pleasure of photographing the soccer team’s stunning 1-0 win over nationally second-ranked Kenyon in October, and that win led to a record-breaking season for regional Division III Coach of the Year Chris Keller’s Little Giants. For me it could be a metaphor for the entire fall sports season. A conference championship and play-off appearances for football, regional championship for cross-country, strong individual athletes in all sports, and honors and national respect for the coaches. And all built off the momentum of last spring’s NCAC track and field titles. Wabash SID Brent Harris says it was the best fall sports season in Wabash history. Even tossed around the term “the Golden Age of Wabash Sports.” And he should know. Those words came to mind last May when President Greg Hess announced the construction of new independent housing, due to open Fall 2015. Pair that with a new fund established by Clay and Amy Robbins that will support student-centered events on campus, then factor in programs that find increasing numbers of students doing their “student jobs” in businesses and organizations in Crawfordsville. It seems the quality and breadth of student life at Wabash is improving all around. 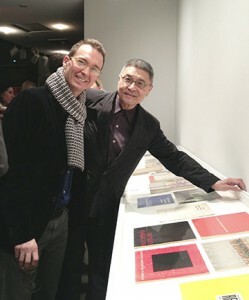 A Great Year for Wabash Artists—Matthew Deleget ’94 earned one of the art world’s great honors when he was invited to exhibit at the 2014 Whitney Biennial in New York City. Nathaniel Mary Quinn ’00 exhibited “Past/Present” at the Pace Gallery in London and earned critical praise and much notice both in and outside of the art world. (Read the Huffington Post and Brooklyn Reader articles.) Not bad for an art department that used to be housed in the Yandes basement! All this in a year of transition for the art department. Filmmaker and painter Damon Mohl brings his own awards to his rookie year as a professor at Wabash, Professor Elizabeth Morton returns from sabbatical with more curating opportunities for Wabash students, and Professor Doug Calisch will celebrate his final year at Wabash with a retrospective of over 30 years of work next fall. And while we’re talking fine arts, Professor Mike Abbott directed what may be the most remarkable theatrical collaboration I’ve seen in 20 years—a staging of Guys and Dolls that brought together music and theater departments as well as the campus and Crawfordsville. Contrast that raucous musical with Professor Jessie Mills innovative and well-received (as in standing ovations every night) production of the dialogue-free play Stage Lights. Just two of many reminders of the gift Wabash theater is to the College and the local community. Then there was songwriter Dan Couch ’89, whose second hit with Kip Moore, “Hey Pretty Girl” went platinum in 2014, even as the songwriting duo was pioneering new musical territory for Moore’s second album. Any prospective students out there interested in a Fine Arts Scholarship? They should be. An English Department in Transition—Agata Szczeszak-Brewer delivered a remarkable and challenging LaFollette Lecture, Eric Freeze published a book of essays titled Hemingway on a Bike, Jill Lamberton taught the College’s first course in audio rhetoric, and Marc Hudson published more of his acclaimed poetry (an interview with him will be published in the Silk Road Review later this month). Professor Emeritus Bert Stern was named an honorary alumnus and published his “long simmering promise”—the biography of Wabash alumnus and pioneering American in China Robert Winter. Tobey Herzog’s final class before retirement was a wonderful template for others to share the works that fired their own passion for scholarship and teaching. But Professor Emeritus Tom Campbell died in July. His class on the personal essay was the forerunner to our courses on writing creative non-fiction. I was remembering how Tom had returned to campus after his retirement for one of Eric Freeze’s readings, ever the supportive colleague. I know he believed the non-fiction writing courses were in good hands. But it is the man we miss. Professor Hudson retires this year; Warren Rosenberg soon after. The “old guard” made certain through recent hirings that the department will always be a great one, in the tradition of Don Baker and Walt Fertig, who preceded them. I wish I could be an English major here today! But Stern, Campbell, Herring, Hudson, Herzog, and Rosenberg—those were vintage years. Standing Really T.A.L.L.— 430 on 4/30,the Wabash Day of Giving in April, raised more than $465,000 in 24 hours thanks to social media and the tremendous response of alumni, students, and faculty and staff. (Many of those donors were first time givers.) The Annual Fund ended the fiscal year with its second highest total in Wabash history, and fundraising journals took notice. President Hess had listed “expanding the culture of philanthropy at Wabash” as one of his first four objectives leading Wabash forward. Associate Dean for College Advancement Joe Klen’s creative experiment paid off (and no matter what they’ll tell you now, plenty of people doubted it on 4/29). It will be interesting to see what’s next. Like a Phoenix Rising—When I arrived at Wabash 20 years ago the College was rumored to be considering dropping the speech department. Look at that department (the Department of Rhetoric) now! It has hosted Brigance Colloquia and other national conferences. Professor Todd McDorman delivered the 2013 LaFollette Lecture. And led by chair Jennifer Abbott, faculty and students have led conversations in Crawfordsville and other communities to address and work to resolve previously intractable problems. Assistant Professor of Rhetoric Sara Drury, inspired by Wabash legend W. Norwood Brigance, is director of the Wabash Democracy and Public Discourse initiative, which last fall hosted the first Public Discourse Summit with keynote speaker David Kendall ’66. Classics, a department that took a hit during the Great Recession, is experiencing a similar resurgence. The 2014 Suovetaurilia turned the once insular department picnic into a reenactment of an ancient feast and a tasty celebration of learning for nearly 250 guests at Goodrich Ballpark between double-headers. One goal, as Assistant Professor Bronwen Wickkiser puts it, is “to make the ancient world more accessible for students, and to experience what the senses teach us about life in the ancient world.” Chair Jeremy Hartnett ’96, a former student of Professor Emeritus John Fisher H’70, as well as of David Kubiak and Leslie and Joe Day, is working on research with faculty from other departments, showing the innately interdisciplinary reach of the Classics. And after retirement, the Days have stayed on to help teach courses and bring their expertise to the curriculum. It’s quite a legacy! “Doing Science” as a Way to Learn—Dean of the College Scott Feller was a newly arrived chemistry professor when I first interviewed him in the mid-90s. His Goodrich Hall office was packed with computers (parallel processors he used to create the “Little Giant Supercomputer”) and students. That day there were two in a space the size of a large closet, both working with Scott on his National Science Foundation-funded molecular modeling research. Scott believes that students learn best by “doing science” alongside their teachers, that their questioning of assumptions and conventional wisdom can benefit high-level scholarship and research. He believes that sort of teaching and learning is worth the extra time required to include them in the work. That model became the seed for the first Celebration of Student Research, Scholarship, and Creative Work (which he put together with Charlie Blaich) and has become a template for teaching across the sciences and social sciences, particularly in psychology. It’s reached the humanities, as well. It’s the way I wish I’d been taught in college. Scott is also a hobby farmer and was hired at Wabash by another farmer, then-Dean of the College Mauri Ditzler ’75. Mauri thought it was no coincidence that so many scientists came from farming backgrounds. As boys, they had to learn to solve problems creatively and with limited resources—perfect training for a young scientist. Scott being named Dean was an affirmation of both his collaborative way of teaching and his way of solving problems. And added another farmer to the list of Wabash deans! Four to Watch—President Hess calls them “liberal arts plus”—four initiatives in which students apply and enrich their liberal arts education. I’ve been watching two of them—Global Health and Democracy and Public Discourse—since their inception. I’ve seen the conviction, passion, and teaching ability behind them. I’ve seen the difference they can make in the world. Knowing the people involved with the other two—Innovation, Business, and Entrepreneurship and Digital Arts and Human Values—I’m confident these initiatives will be equally transformative. They will also give the world focused and tangible way to see and experience what a liberal arts education can do. Keep an eye on these four and your opportunity to be involved. I’m really looking forward to telling these stories. “Taking Them Farther”—This one’s more personal to me, but it stands for something bigger. In September I took my grandson, Myca, to watch the Cole Lectures given by class of 2012 classmate Pete Guiden and Patrick Garrett in September. Patrick is Myca’s dad. Patrick grew up in Crawfordsville but had never set foot on campus prior to his application to Wabash. He earned a spot on the waiting list but had to attend Indiana State for a year to prove he was Wabash worthy. Once here he thrived, thanks to his talents, his own determined effort, and the caring and skillful teaching of professors like Amanda Ingram, David Polley, and Jane Hardy. Now he’s working on his PhD at the University of Miami in Ohio; he returned to Wabash for the Cole Lecture to present his research. Patrick’s visit reminded me of something I heard from Professor Emeritus Raymond Williams H’68 years ago in Center 216. He spoke of recruiting students with less than stellar academic records and “taking them farther” than any other college could. This College, he said, is particularly good at that. I took that in faith when I first heard it from Raymond, but I’ve witnessed it as fact many times since, and none more profoundly than last September. I know what it means to Patrick, I know what it means for Myca. When Wabash “takes a student farther,” we take a family, even a community, farther, too. That, more anything else we do, makes me look forward to our work in 2015.